The family originated at Morville, 3 miles from Valognes in Lower Normandy. The earlier write-up in "History and Antiquities of the Counties of Westmorland and Cumberland" (Nicholson and Burn, 1777) confused the two "cousins" Hugh de Morville of Burgh-by-Sands and Sir Hugh de Morville of Appleby. See "Becket's Murderers" (Nicholas Vincent, 2004, after "The Anglo-Norman Era in Scottish History", by Prof. Geoffrey W. S. Barrow, 1980). Prof. Barrow concluded that the villain involved in the Becket plot (1170) was Sir Hugh de Morville of Appleby, son of the [MORV431] Hugh de Morville who had acquired great estates from King David I of Scotland (who controlled Cumberland and Westmorland, and Northumberland also from 1139). 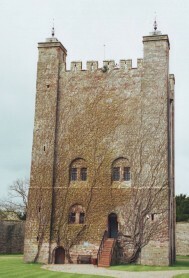 Hugh de Morville (the father) had also been awarded the entire lordship of Northern Westmorland, and his possessions were centred on the castle and lordship of Appleby. This Hugh died 1162. Prof. Barrow also concluded that Simon de Morville of Burgh-by-Sands was most likely a first-cousin of Hugh de Morville (senior) of Appleby; thus making the two contemporary Hugh de Morville's second-cousins at best.
. [MORB421] Lord Hugh of Kirk Oswald m. ? . . . . [MORX451] Ives aka John de Morville m. ? [MORV411] Hugh de Morville, of Kirkoswald, married [TREV409] Ibria Trivers (daughter of Robert de Estrivers & --- de FitzWayne), and widow of Ralph Engaine, see TREVERS). [MORB421] Hugh (probably son of Hugh), is dealt with below. [MORV421] William de Morville (son of Hugh) married Matilda. [MORX431] Eudo de Morville, of Bradpole (son of William) married --- (daughter of Richard de Wroxhall). [MORX441] William de Morville (son of Eudo).married Actina de Witt. 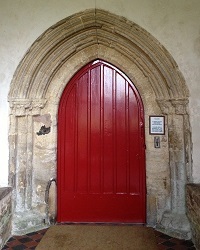 [MORX451] John aka Ives de Morville of Bradpole, Bridport, Dorset, (born c.1207, son of William). [MORX462] Alianore/Ellen (born c.1234, daughter & heiress of John) married [GORG481] Sir Ralph (see GORGES). [MORV431] Hugh de Morville (born c.1105, son of William), befriended King David (who controlled Cumberland, Westmorland and Northumberland), and at his invitation went north to Scotland, where he became King's Constable of Scotland (c.1140). He was granted extensive estates in the Border country, in particular he was Lord of Lauderdale, but also held land along the Tweed at for example Newton Dun, and at Dryburgh (where he founded an Abbey in 1150). Hugh had also been awarded the entire lordship of Northern Westmorland, with his possessions centred on the castle and lordship of Appleby. 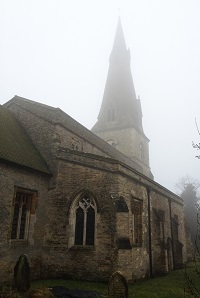 He also held land at Bozeat (near Wellingborough, Northants) in King David's Honour of Huntingdon. Hugh married [BXXB422] Beatrice (see BEAUCHAMP OF BEDFORD), daughter of the greatest landowner in Bedfordshire. Beatrice gave the income from the church at Bozeat (built c.1130) to Dryburgh Abbey. 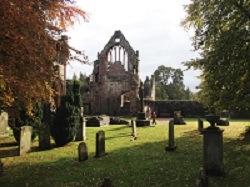 Hugh latterly became a monk at Dryburgh Abbey, where he died c.1162. [MORV441] Richard de Morville (son of Hugh), Constable of Scotland, married [LANK372] Avicia (daughter of William I de Lancaster, see KENDAL (1)). He held Whissendine (Rut) and Bozeat (Northants), but lost these on account of the war between King Henry II of England and King William of Scotland. Richard died 1189, and Avice died 1st January 1191. [MORV452] Elena de Morville (daughter of Richard) married [GALL381] Roland, Lord of Galloway and Constable of Scotland, see GALLOWAY). [MORV411] Hugh de Morville m. ? [MORB421] Hugh (presumed son of [MORV411] Hugh, see above), Lord of Kirk Oswald (Cumbs). [MORB431] Sir Simon (son of Hugh), considered by Prof. Barrow to be "most likely" first-cousin of [MORV421] Hugh de Morville (see earlier). Simon married [ENGA419] Ada (see ENGAYNE), and thus became Baron of Burgh upon Sands. Simon died 1167, and afterwards Ada married 2. Robert de Vaux, 2nd feudal Lord of Gilsland, and elder brother of Randolph, 3rd feudal Lord (see GILSLAND (VAUX) FEUDAL LORDSHIP). [MORB442] Ada (daughter of Simon) married [BERT441] Roger I (see BERTRAM). [MORB441] Hugh (son of Simon) married (after1184) [DEST458] Helewise (daughter of Robert de Stutevill, of Lazenby, Sheriff of Yorkshire, widow of [KEND371] William de Lancaster, who died 1184, see STUTEVILLE). Hugh, Baron of Burgh upon Sands, died c.1202, and afterwards Helewise married 3. William de Gant (son of Ranulf), who died 1209. Helewise died some time after 1228. [MORB453] Ada (daughter & coheiress with her sister Joan of Hugh), received half of the Burgh Barony. She married 1. (c.1200-04) Richard de Lucy, feudal Lord of Egremont, Cumbs, died 1213; then 2. (March 1218) [MULT452] Thomas (see GILSLAND (MULTON) FEUDAL LORDSHIP).